62 • FOODSERVICE EQUIPMENT & SUPPLIES • FEBRUARY 2019 parents with small children and large groups. Staffers also cover front-of-the-house functions such as pre-bussing tables, offering guests fresh-grated parmesan and delivering fresh, free breadsticks on request. The interior itself has also gotten a refresh by way of a new art package with freshness cues and multiple seating options, in- cluding booth, banquette, counter-height and community tables. This high-touch approach isn't confined to the restau- rant's four walls, though. Drive-thrus are a big part of nearly all successful QSRs, and Fazoli's is no different. The chain created a "drive-thru of the future" with an aesthetic that gels with its new interior, including wood-style panels, freshness cues and a larger, easier-to-read menu. 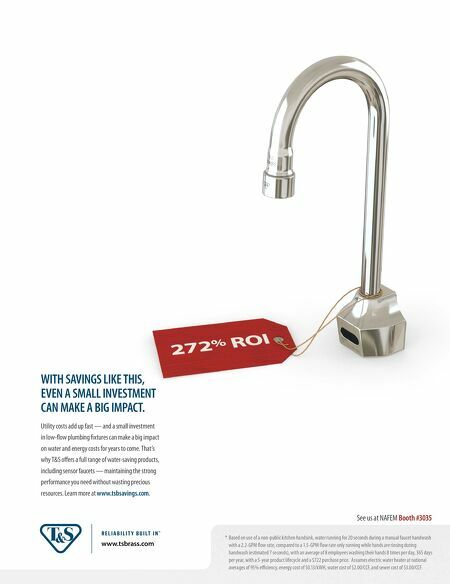 "It doesn't necessarily drive more throughput, but it makes it easier for the consumer. It's not as cluttered. It's a really clean, professional look so the drive-thru guest gets a remodeled experience also," says Howard. RESPONSIVE CUSTOMER SERVICE The chain is carrying its high-touch approach into the digital space, as well. In addition to standard offerings like an app and online ordering, Fazoli's uses a service that allows it to closely monitor its reviews across different sites, including Yelp, TripAdvisor and Google reviews. Each morning Howard receives a rundown of all one- and two-star reviews from the day before. This does more than provide the company with real-time information on restaurant performance. It also gives Fazoli's the chance to make things right with unhappy customers, Howard says. "We communicate to every one of those guests within 24 hours with an apology and some type of incentive to come back and try us again." This sort of responsiveness is important for a chain with just 220 locations, Howard notes. While he doesn't have the size to advertise on television like the QSR giants, in the digital realm Fazoli's can be more responsive and innovative than those companies, he says. 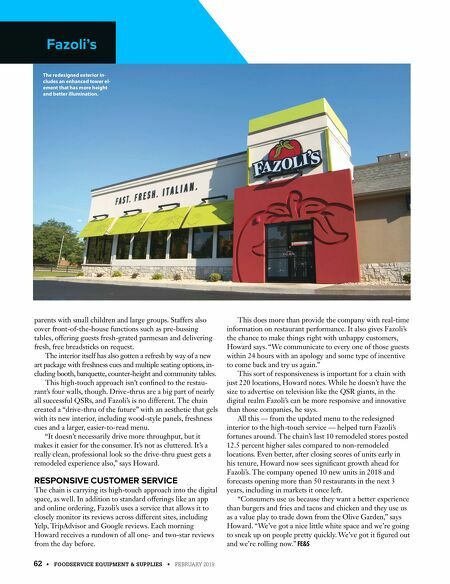 All this — from the updated menu to the redesigned interior to the high-touch service — helped turn Fazoli's fortunes around. The chain's last 10 remodeled stores posted 12.5 percent higher sales compared to non-remodeled locations. Even better, after closing scores of units early in his tenure, Howard now sees significant growth ahead for Fazoli's. The company opened 10 new units in 2018 and forecasts opening more than 50 restaurants in the next 3 years, including in markets it once left. "Consumers use us because they want a better experience than burgers and fries and tacos and chicken and they use us as a value play to trade down from the Olive Garden," says Howard. "We've got a nice little white space and we're going to sneak up on people pretty quickly. We've got it figured out and we're rolling now." FE&S Fazoli's The redesigned exterior in- cludes an enhanced tower el- ement that has more height and better illumination.